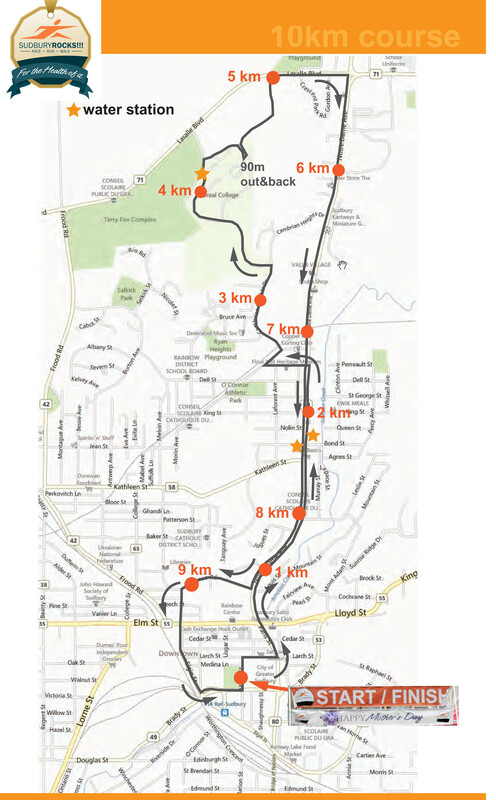 The Continental Insulation10km course adds a scenic extension to the 5k route that takes in College Boreal. There is one fun hill as you approach the campus. Water/Sport Drink and porta potty stations are located at 2km, 4km and 8km. Official time limit for the 10k is 2 hours and 15 minutes. All 5k participants will also fall within the 10k time limit. All participants proceeding slower than 13.5 minutes per km. may be asked to walk along the sidewalks and obey traffic rules. All 5k and 10k walkers and runners will be allowed to finish the race and get an official time regardless of their pace.